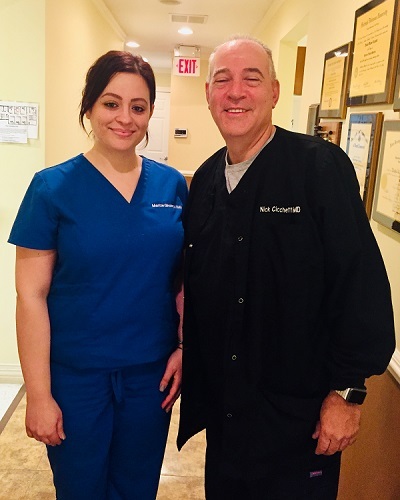 New Jersey dentists Nicolas Cicchetti and Marize Ghobryal and their staff are proud to offer you the very best in dental care. At Cicchetti & Ghobryal Family Dentistry, we strive to provide exceptional dentistry to you and your family. Our practice offers a broad range of general and cosmetic dentistry options to patients in Roselle Park, Elizabeth and throughout the tri-state area. As part of our proactive approach to your dental health we recommend that you schedule a hygiene appointment with Dr. Cicchetti at least once every year so that he can help provide you with the tools necessary to keep your smile healthy and pain-free for a lifetime. Along with offering the most up to date facility we also have a full line of services from complete oral exams, including for oral cancer, cosmetic bonding, porcelain veneers, anti-snoring treatment, Zoom teeth whitening, plus much more.